Parents bringing their child for baptism must attend baptism preparation class (usually one session on a Saturday morning for 4 hours), and must provide a copy of the child’s birth certificate. Godparents must also attend a class, either here at St. Brendan or at another church. Godparents must also be verified by their pastor or his delegate as a Catholic meeting the requirements for being a Godparent (see Frequently Asked Questions below). All documentation must be received two weeks prior to the baptism, or the baptism will be rescheduled. 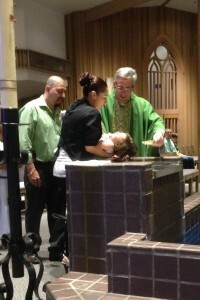 Baptism is celebrated during Sunday Mass by first anointing the child with the blessed Oil of Catechumens, then by immersion in water or by pouring water on the child’s head while the words “in the name of the Father and of the Son and of the Holy Spirit” are said. The child is then anointed with Sacred Chrism, and a lit candle is presented to the Godparents (which symbolizes the child is a new creation, enlightened by Christ). Baptisms are generally celebrated during Mass on the 4th weekend of every month. We do not celebrate baptisms during Advent and Lent. The Baptism preparation classes are generally held two weeks prior to the baptism. Baptism is the first sacrament of Christian initiation. This sacrament is the foundation for all ministry and life in the church, and confers a commitment to follow Christ and spread his message throughout the world. Furthermore, in baptism, one is incorporated into the life, death, and resurrection of Christ, and thus participates in the gift of resurrection and eternal life with Christ. It is the sacrament that frees a person from original sin and makes that person a member of Christ and His Church, thus being the way to a new and spiritual life. One must be baptized before sharing in any of the other sacraments. Baptism is the foundation for all ministry and life in the church, and confers a commitment to follow Christ and spread his message throughout the world. Furthermore, in baptism, one is incorporated into the life, death, and resurrection of Christ, and thus participates in the gift of resurrection and eternal life with Christ. The Church welcomes us into God’s family at the very beginning of life. Can I be a godparent? A godparent must be at least sixteen years old, who has received the sacraments of baptism, First Communion and Confirmation, and be an active member of a parish. If married he/she must have been married in the Catholic Church. You and the godparents attend one class which usually takes place two weeks before the baptism. Can an older child be baptized? A child who has reached the age of reason (age 7) prepares for baptism through a process called Rite of Christian Initiation adapted for children. What documents does the Church need for baptism? We need the child’s birth certificate and a simple form from the godparents’ church affirming that they are capable of being godparents.